﻿Luck was with me in the book winning department this November which has made my mailbox a very happy place. Unfortunately I fear it makes the UPS person a bit nervous as I appear to be stalking them. 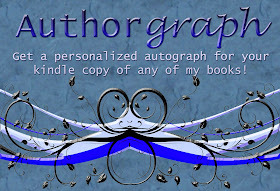 ;) But with good reason, just check out these fabulous books that I won! 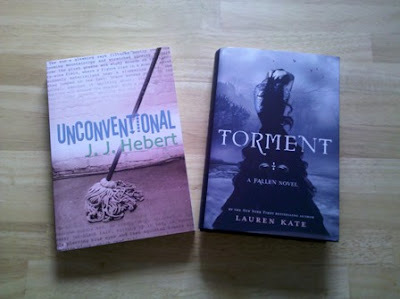 I won Torment, the sequel to Fallen, by Lauren Kate from the wonderful Mundie Moms book bloggers. These ladies are always doing giveaways and their reviews keep my To Be Read list very long. The best part? They never disappoint. Every book they've recommended I love! Follow these gals! I won Unconventional by J.J. Hebert from the fabulous and ever supportive writer of middle grade novels Eisley Jacobs. It looks like it is going to be a very inspirational novel which will make it an excellent read for December! If you aren't following Eisley you're missing out on knowing a truly special lady so click on her name and check her out. Now to get some reading done! What was in your mailbox this month? Wow. You have the luck. All I win from contests is character -- you know, suffering builds character, and all! This Friday, Elena reads the prelude to THE LEGEND OF VICTOR STANDISH (THE HELL-BOUND BUS) on her blog. I'll be posting the link to it and the YouTube video late this evening. Let's hope my good luck continues into the literary field this month Roland! That's excellent that Elena is reading your story! I'll have to check it out. So glad you got TORMENT, Heather!!! Enjoy! What a lucky lady! Have an awesome time reading those books. They look amazing. Yay Heather! I won "Hooked" from Susan Fields. It was so sweet of her! Plus, I ordered a book on revision by James Scott Bell. Once I finish draft one, I'll be studying these books. Ooh, I really liked Torment. I haven't heard of Unconventional, but it sounds great! Congratulations Heather! I can hardly wait to hear how you like them. And... UPS guys, they are a lonely bunch. Rushing from home to home. I think they would appreciate a beautiful woman stalking them--- getting a package and being excited too! I'm sure you made their day. Thanks Sophie, I can hardly wait to read it! They do look great don't they Roxy? I'm loving this lucky streak! I hope your luck turns good too Melissa! We'll have to share notes on TORMENT when you get to it. Congrats on winning HOOKED Julie! I hope you'll let me know how both of those turn out. Those sound great Shannon, especially THE WOLVES BEYOND. I love that title! That's great to hear Elana. 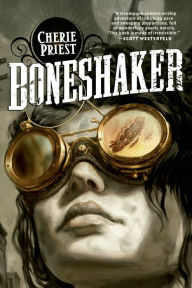 Now I can hardly wait to read TORMENT! I've had the ARC of Torment for a long time, and enjoyed it....but I've never heard of the other book. Let me know how it is. Thanks Lola, I'll definitely let you know how Unconventional turns out. I haven't read Fallen yet either Stina. Looks like I'll have to pick that one up! I've been meaning to. That's encouraging to know that you're looking forward to the sequel though!